So MM referenced this recipe and I decided to make it. I absolutely love, love, love pumpkin -- especially at this time of year. This was the most moist and tasty low-carb, no sugar baked good I've ever had. Would love to try this recipe in mini muffin form. Be sure to follow the directions and wait until it is cooled before removing from the pan. I neglected to pay attention to the instructions, and when I tried to remove the loafs they kinda broke. Also, I split the loafs and made 2 smaller ones, so I got 16 pieces instead of 12. Mine were baked in glass loaf dishes and I reduced the baking time by 15 minutes. See below, my nutritional content is a little different. Perhaps because I used Bob's Red Mill Almond Meal (flour). Incidentally it is a little pricey at my local grocery store at $12.49 a bag. I looked at the comments and saw some people complain about how much Splenda was in it, but frankly I think it's great the way it is. Keep in mind you're using the measurable Splenda, not the packets. 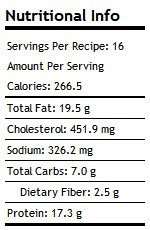 My nutritional info came out a little different (higher). High fat content, but aAt least the fat content is quality fat (Omega 3's from nuts and eggs), but definitely a "treat" not a routine eat. Spray the loaf pan heavily with vegetable spray and sprinkle with the wheat bran, shaking the pan to coat on all sides--this will prevent sticking. In a bowl whisk together the almond flour, sugar substitute, baking powder, pie spice, and salt. In another bowl, beat the eggs and then whisk in the pumpkin and vanilla. Combine the dry and wet ingredients and stir until combined. Pour the batter into the prepared pan and stir to combine. Bake until golden brown and a toothpick comes out clean when stuck in the center, about 1 1/2 hours. Cool completely before removing from the pan. Slice into 12 portions.